As the day drew to a close last Saturday, I drove into downtown Fort Smith. I wanted to visit the Fort Smith National Historic Site, which I think I've only been to once before. That was probably about 20 years ago, when my Grandpa took me there. We probably made the visit because he was tired of his dumb but adorable grandson calling the city "Fart Smith" all the time. But the National Historic Site is an interesting place. It is actually the home of two old forts. The first was built in 1817, when this was a lonely outpost on the western border of the US. The fort was built in order to prevent war between the Osage and the Cherokee, who were being forced to move during the Trail of Tears. In 1824, the fort was abandoned and the troops moved deeper into Indian Territory. The first Fort Smith exists now only as a rock wall foundation, the original buildings long ago lost to history. In 1838, the federal government decided that it wanted another Fort Smith, so construction began on a new fort near the remains of the first fort. Originally planned as a defensive fort, it soon grew into a major supply depot for western exploration. 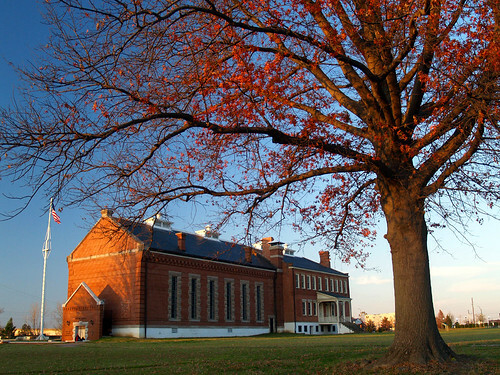 The fort was seized by Confederate troops in 1861, and then by Union troops in 1863. 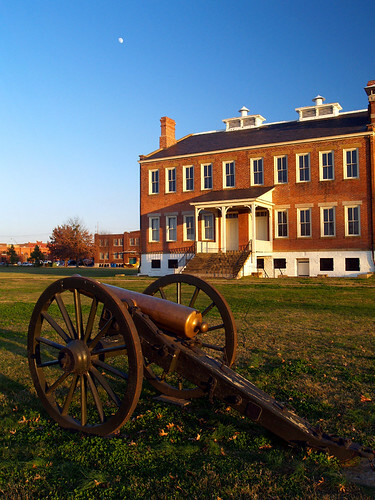 After the war, the government decided that it didn't need the fort anymore, and the buildings became the home of the U.S. District Judge Isaac Parker. The judge was ordered to bring law and order to the unruly frontier, and his justice led to his nickname as the "Hanging Judge." Over 160 outlaws were hung on the gallows (a recreation of which sits next to the parking lot). Inside the building here is the judge's courtroom and the old jail, called "Hell on the Border." The flagpole here is a supposed to look like the flagpole that stood back in the 1800s. 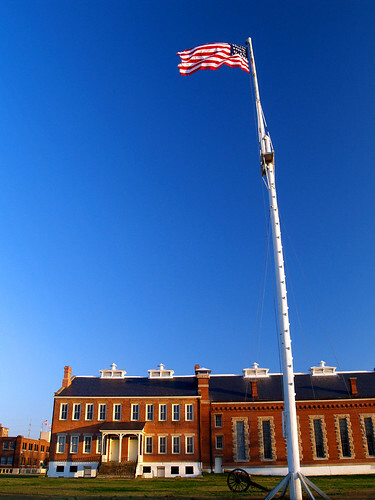 In forts like this, flagpoles were meant to stand high up in the air, so that they'd be visible from a distance. In order to do this, the flagpoles were built like the masts on a ship. The flag here is flying with 37 stars. The setting sun was casting a nice warm glow on the old buildings, and sending long shadows across the ground. I didn't go inside the museum here (since it was about to close and it costs $4). But I did have a nice walk along the grounds. As the light faded in the sky, I randomly drove through downtown Fort Smith. The city does have a nice collection of old buildings. 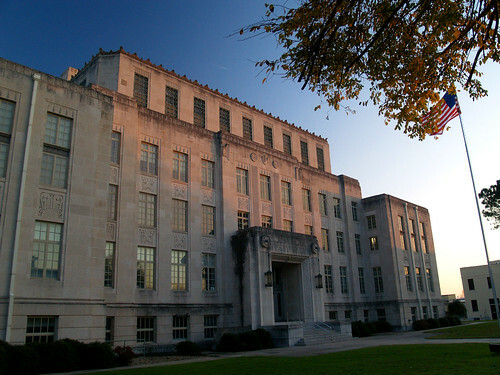 I pulled over at the Sebastian County Courthouse for a few shots. There is a slight rosy glow from the last rays of the setting sun hitting the old building. Western Arkansas has some important and noteworthy landmarks. There is the Fort Smith National Historic Site, the towering views from Mount Magazine, and of course, the giant beer can silo. 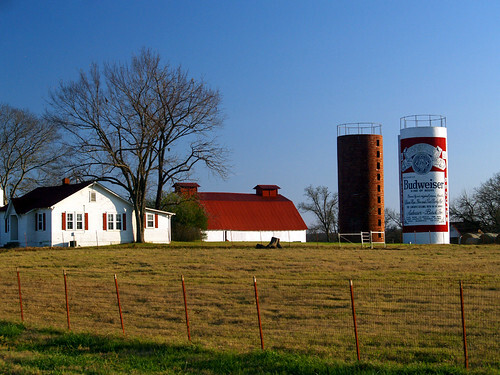 The silo is on a working ranch, in the small town of Lavaca (east of Ft. Smith on Hwy. 22). The silo was painted in the 1970s, and was used in a Budweiser commercial. Someone actually figured that the silo would hold approximately 8,734,902 fl. oz. of beer. Unfortunately, there really isn't any beer in there. Now is the time of year when most landscape photographers go into a state of hibernation. The fall colors have faded away and are mostly now just laying all along the ground. I haven't managed to make it out into the woods for a few weeks now, and all of my picture taking have been around downtown Little Rock. After work yesterday, I met up again with Windy Richardson for some shots downtown. We first decided to make a few stops at the Big Rock, which is a low hill along the Arkansas River in North Little Rock. The Big Rock was noticed by French explorer Jean-Baptiste Bénard de La Harpe in 1722, who called the hill “Le Rocher Français” or "French Rock" (or I guess Freedom Rock nowadays). Le Harpe is also the guy who called a nearby smaller outcrop along the Arkansas River "little rock," a name that stuck around. And here's an amusing story (and sorry this is becoming a history lesson), but when the French explorers were sailing up the Arkansas River, Native Americans told them of a massive green rock along the river. The explorers thought that it must be a massive jewel-encrusted rock (which makes them seem a bit gullible). They must have been dissapointed to make it to the Big Rock to find that the large green rock they had been dreaming about was just a bluff with trees on it. But that story is the basis for the name of Emerald Park, atop Big Rock in North Little Rock. The hill, which has a 200-foot tall bluff along the river, eventually became known as Big Rock. Settlers moved into the area in the early 1800s, but there weren't many since the north side of the river is lower than the Little Rock side and flooded often. A quarry began operation in 1849, which cut out a huge chunk of the Big Rock. The area where the quarry worked is now part of Emerald Park. In 1870, an orchard and vineyard were in operation on Big Rock, and then in 1887 the Mountain Park Hotel opened as a summer resort. All of this land was taken over by the federal government in 1893, and Fort Roots would officially open in 1897. Many of the century-old buildings still stand at Fort Roots, which is now boringly called the "North Little Rock Regional Office of the Central Arkansas Veterans Healthcare System." 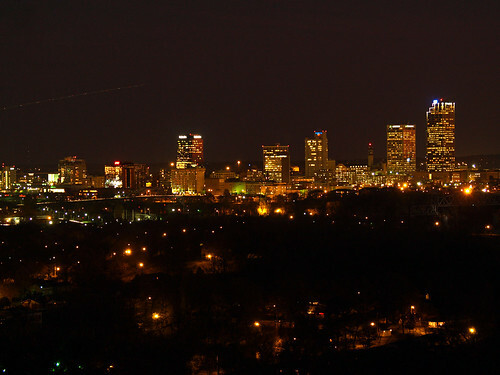 It's the home of the VA hospital, but it is also home to one of the best views of downtown Little Rock. It can be a bit tricky getting shots, since security guards will quickly kick you out if you're caught. Since it is now a hospital, no photography is allowed out of concern for patient privacy. So we kinda snuck up there to get some shots, and luckily weren't busted by security. It is a beautiful spot to overlook the city, with dusk quickly and silently settling in. I had a few hours to kill before going to watch the MLS Cup last night, so I drove through downtown Little Rock trying to find something to take pictures of. I stopped and walked around The Old State House, then drove around the state capitol, and then puttered up and down the mostly empty streets. But I stopped at a parking lot in front of one of my favorite buildings in Little Rock, and decided that it was the perfect night to get a shot of it. That building is the Centre Place building, which is located along Center Street. It's an interesting building - about twelve stories tall but very narrow. It's an old building, but I wasn't able to find out much about its history online. It isn't listed on the National Register of Historic Places, and none of the websites about history in Little Rock mention the building (at least that I saw). But the old Centre Place building has somehow managed to still stand against Little Rock's tireless efforts to tear down historic buildings. 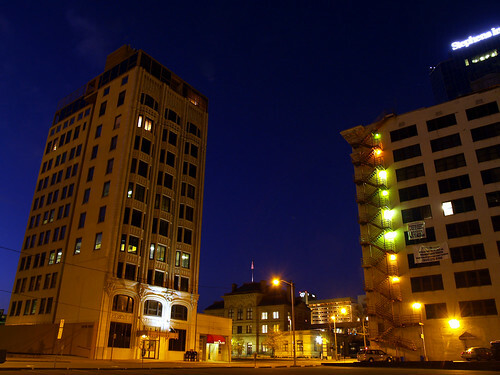 The building now stands tall among parking lots, which were empty that night. But it was in one of those parking lots where I set up the camera while waiting for dusk to fall. 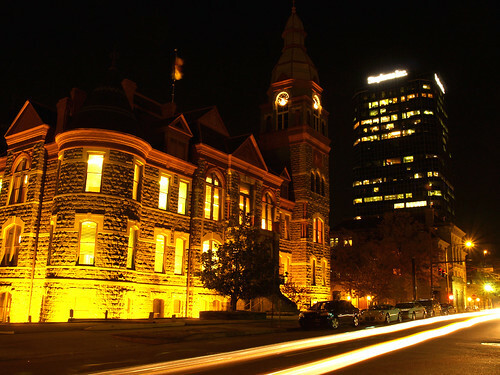 In the background is the old Federal Courthouse, which was built between 1876 and 1881. My choice for a shooting location left me a bit exposed - I was just standing in the middle of a parking lot. I just knew some sort of crazy or homeless person would walk by to ask for money. Which, luckily enough, that didn't really happen. A few people did walk by along the sidewalk just a few feet from me, but didn't bother the weirdo next to the camera. Just as it was nearly dark, I saw two guys riding bikes down Third Street. They were heading west in the eastbound lane of traffic, one of them doing a wheelie as he traveled down Third. They both turned and then went up Center Street (the wrong way down a one-way street), but then eventually came back to where I was standing. They both rolled up to where I was standing, one coming a bit too close to careening into the tripod. He looked at the camera, and asked me the required question for whenever someone is spotted with a camera: "So you taking pictures?" I said that yup, that was what I was indeed doing. He then asked, "of what?" I told him I was taking pictures of the building across the street, and he looked off with a long gaze towards the Centre Building. He was quiet for a few seconds, and then proceeded to tell me that "I've never been good at taking pictures. I see stuff like this and it looks like sh-t, but when I see pictures of it, it looks great." Which I guess is a compliment. With that, he and his friend stoically looked back towards the Centre Building as if they were gazing at the Statue of Liberty or Mount Rushmore for the first time, and pedalled off. But just a few seconds later he was back. He asked me if I knew anything about the history of the building. He turned out to be a good tourguide. He said he had done some work on the inside and that there was a sign with a short history. I can't remember the specifics now, but he said that the frame was built sometime before 1910, but money ran out and it sat incomplete for a few years. Finally some money was found and about nine floors were built. A few years later, two more floors were added. And then in the 1960's, the final floor was added on. I thanked him for the history lesson and they rode off into the sunset. And here is one last shot of the building. On the right is the Pyramid Building - another old building (also built around 1910 or so). The very top of the Stephens Building (built in the 1980s) towers over it. My good friend John, who works almost in the shadow of the Centre Place building, helped out some with the building's history. When it was built, it was actually called the Union Life Building. 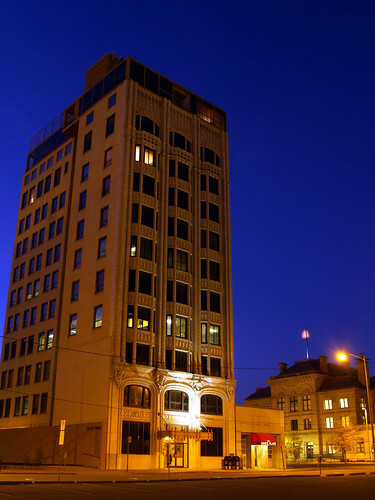 It was built in 1917 in the Chicago architectural style. The building was indeed added onto the National Register of Historic Places in 1981. I should also add that Dave's Place, a restaurant in the small one-story building attached to Centre Place, is awesomely good. I have seen a lot of pictures from here (which are much better than this one), but it is something to see those endless lines of markers, all lined up in such perfect precision. 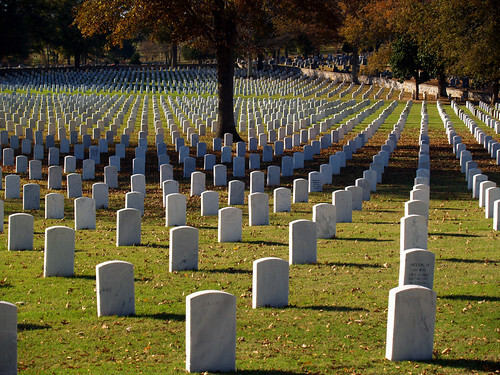 There were several graves of unknown soldiers there, sitting at rest beneath massive oak trees. Although the cemetery is located in the middle of the city, it was quiet there save the muffled rustling of fallen leaves. Last Thursday it poured down rain. Some parts of Central Arkansas received almost four inches of rain during the course of the day. While I did curse the rain during the longer than usual commute to work (drivers tend to freak out when they have to turn their windshield wipers on), I was eagerly awaiting a weekend spent looking at waterfalls. I tried to think of a few places that would have both some lingering fall color, and waterfalls. But that nasty storm system that dumped so much rain quickly moved on, which meant that it was bright and sunny all weekend. This was good for Trick-or-Treaters, but awful for waterfall photography. I just gave up and stayed home. It ended up being a productive day. I needed to get a print made, so I met up with my friend John in downtown Little Rock. We ended up visiting a few different places around town, in search of some nice fall color. This was taken along Second Street, looking up at the Stephen's Building. There were window washers out on the building that afternoon, and they were quickly seen dropping down the side of the skyscraper. We got in the car and visited a few other places. The trees at the Clinton Library weren't all that impressive. We moved on to MacArthur Park and the old Arsenal Building. 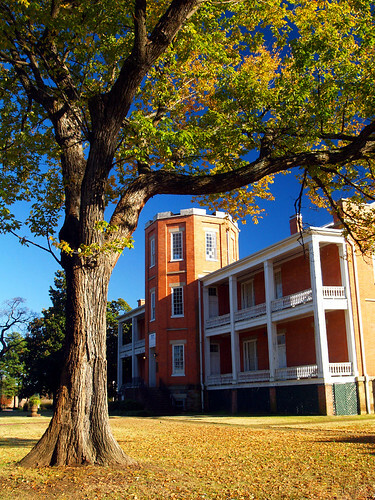 This is one of the oldest buildings in Little Rock, and it has a huge lawn with several towering old trees around it. 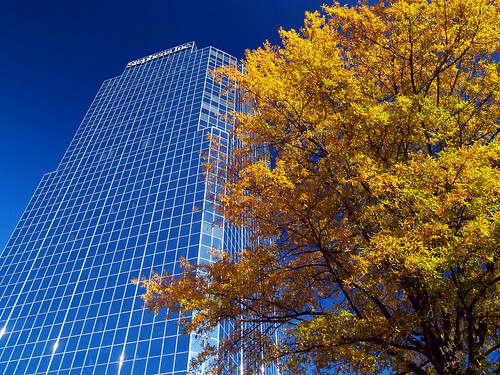 I don't think the fall colors around Little Rock were as impressive as the colors up in the Ozarks this year, perhaps because of all the recent rain. Apparently fall colors depends on some top-secret and complicated formula that involves sunny weather and varying amounts of rainfall. Too much or too little, and things turn out to be a bit lackluster. Or something like that - that big storm probably knocked most of the colorful leaves off the trees before they had a chance to shine. The office that I work out is located far out on the western fringe of suburban Little Rock. The location isn't great when you are battling rush hour traffic every day (especially if its rainy and people forget how to drive). But the office is awesome because it's just seven miles from the parking lot at work to the parking lot at the base of Pinnacle Mountain. It only takes about ten minutes to drive out there, and it's a nice place to visit on lunch breaks. So last week, I left for lunch and drove out to Pinnacle. It was pouring down rain, and the low hills around Pinnacle were shrouded in fog. My first stop was to see if the picnic area and trails at the base of the mountain were open. The area is susceptible to flooding, and we had a lot of rain lately. But I was surprised to see the area was open, and I was not surprised to not see another person out there. I decided to walk the Kingfisher Trail, holding a small umbrella that didn't do much to keep out the rain. Other than that, it was a pleasant hike - not counting the parts of the trail that were under a few inches of water. Quickly the trail curves around and runs alongside the Little Maumelle River. 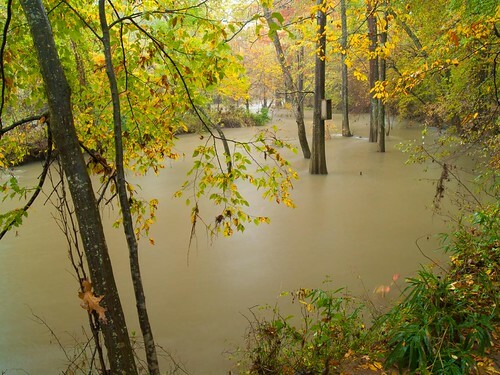 The water was high and muddy, quickly flowing past the tall cypress trees along the bank. And a view of Pinnacle Mountain itself, by the parking lot for the trail. 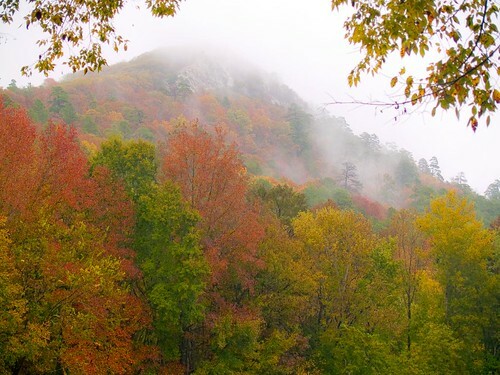 The fog and rain really did help saturate the fall colors out there. 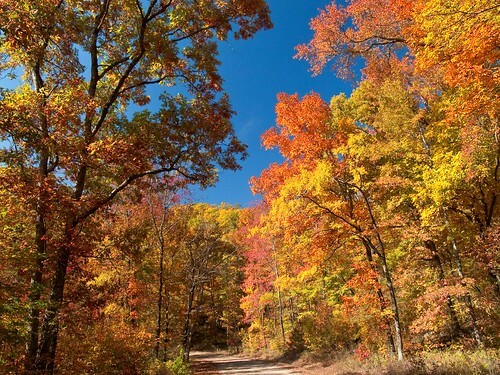 It has been an odd autumn in Arkansas this year. We have had record-breaking rain (in fact, October was one of the wettest months ever in Little Rock). The large amount of rain dampened the fall colors a bit, the oak trees here are just turning to a stagnant brown instead of changing into a more pleasant color. 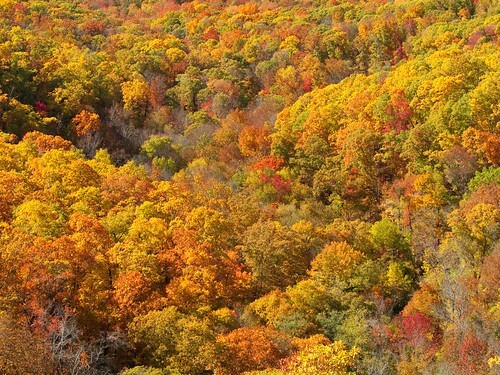 But the past few weeks have seen some great fall color up in the Ozarks. I woke up a few weeks ago in Charleston, after my cousin's high school football game. I was in the western part of the state, and had some great places all around me to go and visit. There were some other photographers meeting up at Petit Jean that weekend. But since I was so close by, I decided to drive up and visit White Rock Mountain, a neat spot in the Ozark National Forest. 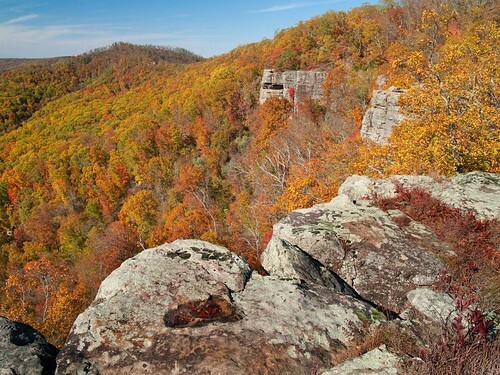 White Rock Mountain is located northwest of the city of Ozark. But the best way there, which has the least amount of dirt roads, is to travel up north from Mulberry. So I set out and headed up the road from Mulberry, only to misread the directions and turn around since I thought I had missed the turn (a shame, since I'd been that way a few times before). I drove back to the freeway, then re-read the guidebook in a confused manner, realized my mistake and sheepishly drove back up north. From the Mulberry exit on I-40, you drive about 12 miles north to a turn-off that leads to Shores Lake. But once you get to Shores Lake, the road turns to dirt and gets much more bumpier. The Forest Service has done some work recently to improve the road, but you still have to drive really slow through parts to avoid some rocks and gullies in the road. My new car was covered in dirt after the trip, a coating that even all of the rain we had last week failed to clean off the car. At the top of the mountain, I was surprised that it wasn't all that crowded. Everyone else must have been at the Buffalo River - I heard reports of sixty cars parked along the dirt road at the Hawksbill Crag trailhead that weekend. From the main parking area it's just a short walk to one of the most popular views on the mountain. There are several miles of trails that go along the top of White Rock Mountain. I followed one for a bit, that goes along the edge of a tall bluff. This is the view looking down into the Ozark Mountains. And a reminder - if you visit here, be very careful. The trails run right alongside the bluffs, so mind the edge. I hiked along the bluff for a bit, and decided it was time to head back home. The drive back down the mountain added a new layer of dirt to the car. 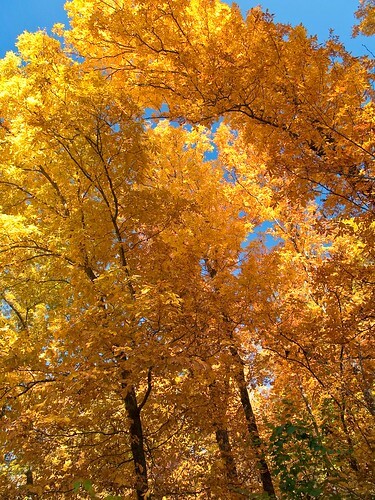 But it also provided for a few more stops to see more of the fall color. This was a particularly vibrant stretch of trees alongside the road. A few other people drove by and looked out in appreciation of the fall colors. One person was standing up in the car, her head and shoulders rising up through a car's sunroof. She had a camera pointed out, and she had a big smile on her face.